When you feel like you want to go the extra mile and impress someone this is an ideal recipe. You can mix up the ingredients to your taste and what’s in season at the time. 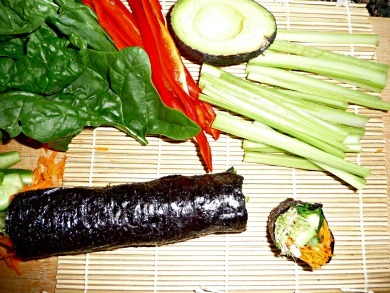 Really anything goes as far as fillings for these delectable veggie rolls go. The can be fun for a dinner party when you have all the ingredients in bowls in the middle of the table and each guest makes his or her own wrap. Most of the traditional raw sushi recipes are made with cauliflower “rice”, but parsnips make a nice variation also. I opted for fresh tender carrots to go with my assortment of other fresh veggies. 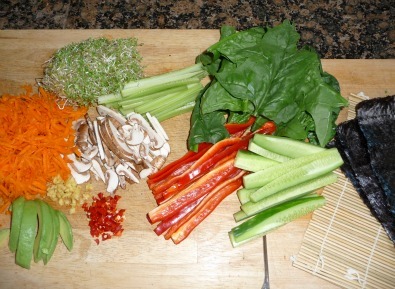 Lay out your nori and place veggies inside keeping them uniform all the way across the short side. Begin rolling from that end holding in the ingredients tightly as you go. When you get to the end you can dab a little water to help the roll seal and stay closed. You could make some type of tahini sauce or such and put in the rolls or place on the side for dipping. I had my bamboo roller, but just ended up rolling them by hand. This recipe makes enough for 2 people as a side dish.